As you all know, Nintendo pushed a huge update yesterday. Turns out it’s a rather lame attempt to block, among other things, our installer. They also remove The Homebrew Channel and DVDX on every system menu startup, but for that they just hardcoded the used title IDs. So let’s play this silly game: let’s switch title IDs! The [boot 2 update] code [from Ninty] is so buggy that we decided to write our own for the HackMii installer. It’s really sad, but that wasn’t exaggerated at all. 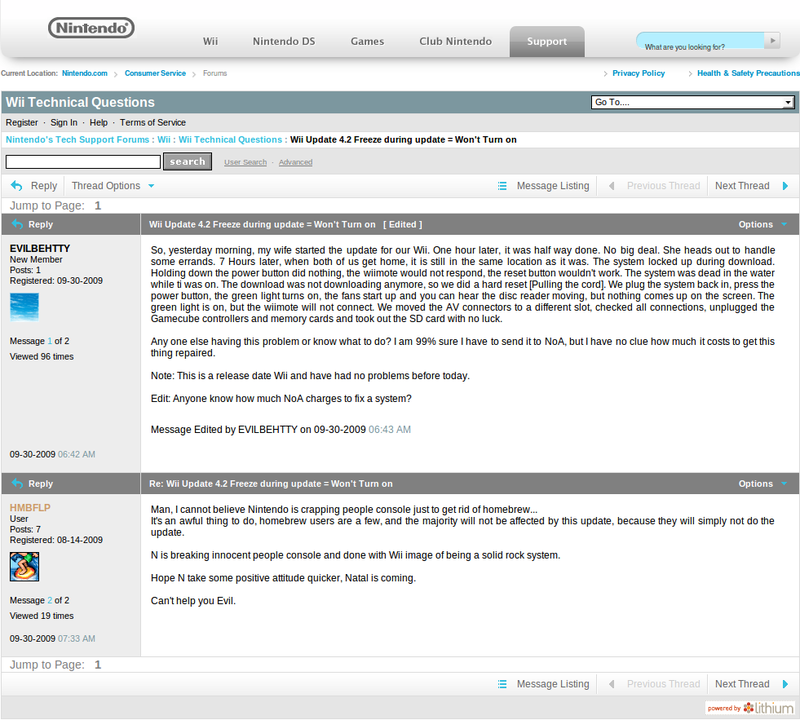 The first reports about bricks due to this official boot2 update are reported on Nintendo’s forums. Replies, which Ninty doesn’t like, are getting deleted. Anyway, it’s up to you if you want to risk it. If you already updated to v4.2, this version is the only one that works. If you don’t have HBC installed, use e.g. Indiana Pwns to launch this installer. If you want to update to v4.2, you should install HBC before updating. Because of the new title IDs, the HBC and DVDX version from this installer won’t get deleted on v4.2. Installing the new HBC before updating ensures that you have a working HBC afterwards. BootMii/boot2 was wiped only if your boot2 version was v2 or v3. Just reinstall it. BootMii/IOS will still be there. DVDX got deleted, reinstall it. General advice: Don’t use some random update application, just update through the system menu if you really want to update. General note: If you install anything with this installer version, update all the components you have already installed. E.g. : BootMii required some changes too, so the HBC with the new title ID gets loaded. Note about DVDX enabled applications: Because of the new title ID, all current applications will fail to load DVDX. libogc needs additional code that checks for the new title ID. All DVDX enabled apps need to be recompiled afterwards. Because Ninty fails to deliver new features with the latest update, I guess we have to compensate for that. Focus on this release are the promised improvements for HBC. New exploit to enable (un-)installation of all components on fully updated Wiis. Fix hangs on some setups (they’re all related to retarded IOS patches). Properly write the keys to nand.bin. This fixes the “NAND dump is from another Wii” issue on restoring beta 3 backups. If you don’t know how to fix those dumps, you have to backup the NAND again. Dumps from all other versions are not affected. Prefer boot.elf over boot.dol when launching apps. New shiny fonts, tweaked to the last subpixel. If your Wii is set to 16:9 in the system menu options, HBC won’t stretch the picture like it did on older versions. Unfortunately the fonts might look a little weird then, it really depends on the used display unit. Blame the lack of true widescreen support on the Wii for that. Hit 2/Y while browsing applications to switch between the old and the new view. This shows 4 columns on 16:9 setups, 4:3 users only get 3. You can remove and insert devices (front SD slot, USB mass storage, and SDGecko in both slots) at all times now without reloading HBC. To change to another device, hit 1/X to bring up a simple option dialog. You can now choose how to sort the shown entries. Current options: either by the name or by the release date. Note that for the latter sort order a valid release_date tag has to be present in the meta.xml file. Again, hit 1/X for the options dialog to set this. On-the-fly compression: Uploaded files are automatically compressed on PC side: This makes it way faster, especially on bigger files. ScummVM, anyone? Improved USBGecko support: Faster uploads, and you don’t have to stop reading debug messages from the device while uploading files. libftdi support: Because ftdi-sio fails, especially on OSX. Note: Because of these improvements, older wiiload version and 3rd party upload clients are incompatible. Use the bundled v0.5, binaries and source code are included. To add apps: Just wiiload a ZIP archive, it will then get extracted to the active device. The ZIP file must be structured in a certain way, check this description for the details. To delete apps: There’s a new button on the application dialog. Allow PPC side hardware access. Also known as the magic HW_AHBPROT register. TMD version bumped to 2, in case anyone needs to check for e.g. HW_AHBPROT. Either grab the new installer here, or use the HBC online update (a confirmation dialog should pop up when launching HBC). As always: Please link to this post instead of mirroring the binary, thanks. Is Indiana Pwns the only way to get this version of HBC on a virgin Wii? Cuz if so, Im pretty much boned. Why was the decision to give priority to *.elf files made? Yes, you can restore NAND to downgrade (you can’t easily downgrade boot2 though, attempting to just write over with the old boot2 will brick the Wii. But a NAND restore won’t touch boot2 anyway, BootMii never writes to that region).